The first home game of 2019 sees the Basque team arrive at Camp Nou looking to stop Barça from increasing their lead at the top of the La Liga table. FC Barcelona face Eibar in the first of three games in a week at Camp Nou. With wins in the last five games and the same number of points separating them from Atlético Madrid in second place going into thr week, things are looking great for Ernesto Valverde and his team. Barcelona have won ten, drawn one (1-1 with Athletic last term) and lost none of their games against teams from the Basque Country since Valverde took charge of the team. Lionel Messi holds the record for top flight goals against Eibar (12), and did that in just seven encounters. If he scores again on Sunday, he’ll become the first player to ever break the 400 barrier in Liga fixtures. Luis Suárez is also an expert at scoring against Eibar, having netted in all of his last five meetings with them. A goal for him would also be a milestone for he’d break into Barça’s all-time Top 5 marksmen. The two teams have only ever met in the League, and since their first fixture on October 18, 2014, they’ve faced each other on eight occasions. 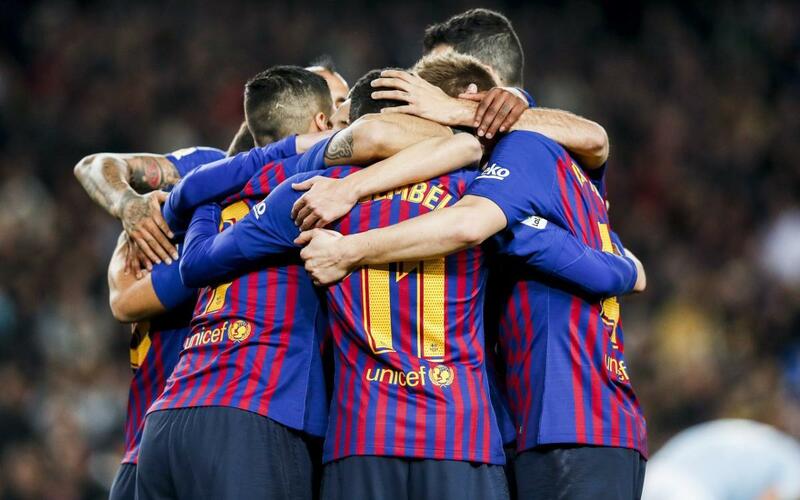 FC Barcelona have won all eight encounters with a balance of 28 goals scored and four conceded, and have managed four goals or more in four of those games. In fact, no team has scored as many top flight goals against Eibar than FCB. The last time the teams met was in round 24 of last season, with Barça winning 2-0 on the road thanks to goals from Luis Suárez and Jordi Alba. Barça have lost just one of their last 10 matches, the midweek Copa del Rey defeat to Levante. They’ve kept four clean sheets in that time and have scored four or more goals on three occasions. In their last 10 matches Eibar have beaten Real Madrid and Alavés, and also drawn their last five in a row including an epic 4-4 against Levante. BARÇA: Rafinha, Samper, Umtiti and Vermaelen are all injured, while Malcom also missed out on a place in the squad list: Ter Stegen, N. Semedo, Piqué, I. Rakitic, Sergio, Denis Suárez, Coutinho, Arthur, Suárez, Messi, O. Dembélé, Cillessen, Lenglet, Murillo, Jordi Alba, S. Roberto, Aleñá and Vidal. EIBAR: Barça B left-back, Marc Cucurella, is on loan to the Basque side until the end of the season, as is Barça B striker Marc Cardona. Cucurella has played 12 games between league and cup this season and has scored one goal, while Cardona has appeared in five, also contributing one goal. The veteran, Charles (34), is their current top scorer with six goals, whilst Sergi Enrich has four. During his playing career, José Luis Mendilibar was most well known for his time at Sestao and Bilbao Athletic, though he also had spells at Logroñés and Lemona. He’s in his second spell at Eibar after coaching them in the 2004/05 campaign where they narrowly missed out on promotion. Though football in the region goes back to the early part of the last century, Eibar weren’t formed until 1940 - as Eibar Fútbol Club. Their name would change on multiple occasions before Sociedad Deportiva Eibar was settled on. The Txaltxazelai pitch which they used for games had to be rented from the council due to space requirements, and in 1942, the club were banned from official competition because of being unable to fulfil regular fixtures. Ipurua became their permanent home in the latter part of that decade. By the early fifties, Eibar had got themselves promoted to the Tercera Division for the first time, and after three seasons, they went up again, to the Segunda, where they stayed for five seasons. From the 1958/59 campaign to 1985/86, aside from three seasons between 1976 and 1979, Eibar were stuck in the Tercera again. Segunda and Segunda B was their home from 1988/89 until 2013/14 when the Basques finally hit the big time, gaining a first-ever promotion to La Liga. Famously, the club had to increase their capital value in order to take their place in the elite, and 34,486 shares were issued that summer at €50 each, in order to ensure enough funds were raised. Money came from all corners of the world and, since then, Eibar have always been a top flight club. Their finishing position has also increased in each of their four campaigns so far. Eibar had originally played in a white kit, but in the 1943/44 season, the Guipuzcoan Federation gave them some FC Barcelona shirts and, ever since then, they have had Blaugrana as their colours. In 1987/88, when the club returned to the Segunda División after a 30-year absence, the kit man, Zapico, went as far as buying brand new FC Barcelona jerseys from a department store, unstitched the badge and then replaced it with Eibar’s.